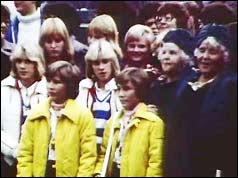 O On this day on 1977, 90 sets of identical Swedish twins (it was cute) took part in studies by researchers and scientists who were investigating links between the environment and human behaviour, Stockholm. Because they are genetically identical, sometimes we have hard time distinguishing one from another, the differences between them are typically the result of environmental or external influences. I think this is one of the cutest study ever. It must have been a pleasure to see pairs of twins, they are so wonderful and precious. Each one was not born alone, they have a friend, in default. That is priceless.